While we think of oxygen as being essential to life in the air we breath, oxygen is essential to life in a body of water as well. The process of aeration will infuse oxygen into your pond or lake. Providing aeration into your body of water will not only help the fish and other aquatic organisms living within it, but it will also help establish a healthy and and thriving ecosystem. When you use proper aeration techniques, the water quality of your lake or pond is greatly improved. When a body of water is oxygen deprived, lake-bottom sediments commonly referred to as muck or silt release various gases that can cause water quality problems. Aeration not only stops the release of these gases, but it can enhance the water quality by stabilizing pH, reducing alkalinity, and removing carbon dioxide and also greatly decrease the cost of pond or lake treatments that might be needed without proper care. There are many great ways to control, prevent, and get rid of muck and aeration is one of the best and eco-friendly ways to do it. Aeration can also greatly reduce and control the amount of pond algae that forms on a lake or pond through a variety of processes. With aeration, algae spores can be mixed towards the deeper parts of the lake or pond areas, reducing the amount of time it is exposed to the valuable sunlight that it needs and reducing its chances to grow. Higher dissolved oxygen levels can also lead to a shift from harmful blue-green algae to less noxious green algae. Another very important benefit of aeration is the reduction of phosphorus levels in lakes or ponds. Phosphorus is needed to support algae blooms, and once phosphorus enters a body of water’s ecosystem it can be extremely difficult to remove. Aeration accomplishes this by using an oxidation reaction which causes the phosphorus to sink into the sediments where it remains unavailable for plant and algae growth as long as sufficient levels of oxygen are maintained. Aeration will provide many different benefits to your lake or pond’s ecosystem. Besides enhancing fish habitats, improving the overall water quality, reducing and controlling algae and its growth, and removing phosphorus, aeration can also break down unwanted bacteria, help with mosquito problems, and remove foul odors from your lake or pond, all by circulating the water and adding dissolved oxygen to it. 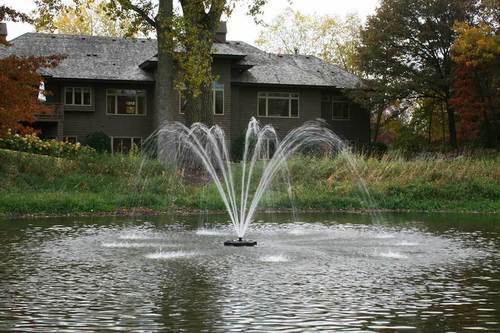 Pond aeration is available through a variety of different mean, whether through surface aerators like floating fountains, or with a product like the Airstream Pro Aerator which offers breakthrough technology that combines jet aeration and high volume circulation together in one high quality system. Now with the understanding of the benefits of aeration for your lake or pond, check out the products above and feel free to contact one of our lake & pond experts here to discuss what is best for your lake or pond.